Mix and Mingle at our Holiday Jingle! SOLD OUT! 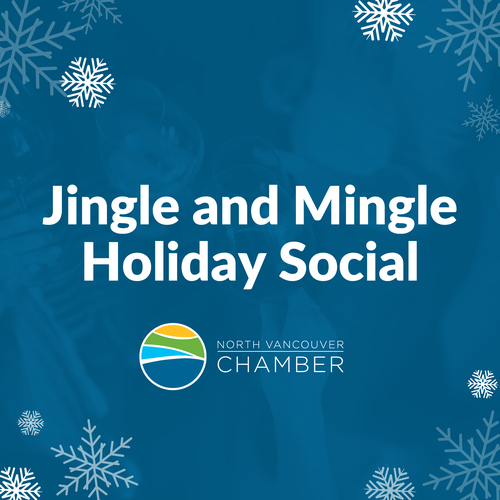 Wrap up the year with friends and colleagues at our annual Jingle & Mingle Holiday Social at The Profile - Lower Lonsdale's latest Co-working Business Club. Enjoy Heritage Roast Beef on a bun at the Chef Carving Station, Vegan Platter of grilled and raw veggies and a delicious variety of canapes by Served Catering. Hear Chamber Vice-Chair Jodi Westbury, Director Marketing and Communications for Grouse Mountain Resorts, for her take on preparing for the winter season and The Peak of Christmas at Vancouver’s North Pole, Grouse Mountain. Jodi will share how they prep for the holiday season, and share some anecdotes on how they face challenges at this time of year. Cash bar - will include a selection of wine, beer and soft drinks. In the spirit of the season, we will be collecting donations for Hollyburn Family Services Society. Guests are invited to bring a donation. Preferred items include: concession bus tickets, movie tickets, grocery Gift cards, retail Gift cards, new socks/underwear for teenagers, winter gloves and small umbrellas. Cancellations must be submitted 5 full business days prior to the event for a full refund or provide alternate attendee.